Kinect Sports Rivals arrives as an important exclusive title for the first year of the Xbox One, produced by the seminal developer Rare and carrying the flag of the Xbox brand. While it undoubtedly looks terrific and is delightfully fun in sections, the overall package is a bit too hit and miss to achieve greatness. And its biggest issue? That it suffers from Microsoft's recurring headache--using your body as a controller via the Kinect. Right off the bat, you need to ensure that you’re prepared for the space and lighting requirements Rivals demands. Compact rooms are far from ideal, as you’ll need at least six feet between you and the front of the camera, plus several more on each side of your body. Poorly lit areas and furniture near or next to you are also recipes for trouble. In order to play half of the modes, I had to move my system from my upstairs home office to a much larger room; the change in scenery dramatically improved the overall responsiveness of the Kinect. That can be a significant request to make of people, though. Whereas the logistics of Rivals can be demanding, what’s not even remotely demanding is finding charm in the game’s presentation. The process to scan your body and produce a comic book-tinged avatar is quick, simple, and impressive. Rivals’ art style is slick and inviting, as each game mode combines aspects of realism with science fiction. Gorgeously rendered choppy waves, wooden bowling alleys, and steep-angled rock formations are interspersed with magically appearing bowling balls and tennis rackets or the immediate re-assembling of your digital self after you fall thousands of feet from the edge of a mountain. The vibrant, bright world lets you follow a story-driven path or hop right into some one-off single-player or multi-player games. That’s where things really shine--and fall apart. 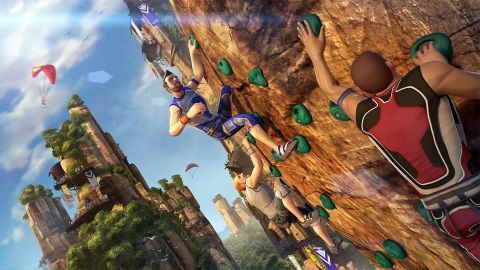 The six sports featured in Kinect Sports Rivals could easily be categorized as “Joyous," “Been There Done That," and “Brutal." On the “Joyous” front are Wake Racing and Target Shooting. Simple controls combining body and voice, lovely visuals, and a solid progression of difficulty and fun put them at the top of the ladder. Bowling and Tennis fall clearly into the “Been There, Done That” bucket--after all, it’s been close to a decade since Wii Sports introduced the concept to the world. While bowling in particular is easy to play and looks great, the not-quite-right recognition of you trying to bend and alter the ball’s spin relegates it to average status. Tennis is even less responsive, as the timing of the swing does not ever feel tight; I had the most success when swinging at the moment the ball bounced, even though that meant my follow-through occurred well before the ball actually reached the target. The roughest aspects of Rivals--aka the “Brutal” bucket--are the Rock Climbing and Soccer games. Getting yourself up the side of a cliff is an often-frustrating adventure, and the most success I had was when I quit trying to time my climbs perfectly and just flailed my arms as quickly as possible. Of all the modes, Rock Climbing required the most re-starts to accomplish tasks simply because my avatar didn’t enough enough do what I wanted him to do. The Soccer mode is an interesting concept--you kick the ball to players in succession down the pitch then try and sneak a goal by the keeper, then it’s your turn to defend an opponent by standing in goal yourself--but the timing of my leg swings for power and direction never felt right. In the end, after a dozen matches, I resigned myself to the fact that it just wasn’t much fun. Rare included a story mode of sorts to properly orient and train you in each of the events--and to provide a sense of progression. And while the narrative does a nice job structurally of navigating through everything you can do, the cutscenes and characters quickly become annoying. The fact that they’re unskippable (even when repeated) is even more grating. Thankfully, winning events generates currency that allows for a terrific amount of character customization and upgrades, which helps you distinguish yourself and move up the ranks. Of course, you can avoid the storyline altogether and just jump right in to play with friends and family, which is welcome. Bowling is the easiest game to play for newcomers, but the Target Shooting and Wake Racing also work well in that setting. None of the modes take too long to play--10 frames of bowling is the largest investment of time you’ll make--so if your Xbox One is in a large, centrally located place and some people are over, Rivals definitely offers some bang for your buck. Ultimately, Kinect Sports Rivals will produce some good times, but it's far from a killer app. It’s often difficult to tell why something isn’t working as well as you’d like--is it the game, the Kinect, or me? But when proper Kinect body detection happens in conjunction with an enjoyable event, there’s fun to be had. Rivals is bright and colorful, and bears many of the quirky, tongue-in-cheek hallmarks for which Rare is known. Unfortunately, only a few of the sports are fun to play, and its long-term appeal seems firmly rooted in the novelty party game camp. Kinect Sports Rivals does a decent job of filling the Xbox One party game role, but it's an uneven package. And also, make sure you've got a big room--the Kinect is going to need it. Description Sports with Kinect, round two.